This was written in the afternoon of April 24, the day after the accident. For those of you who haven't already heard, Lara died in a rappelling accident while we were descending the NE Ridge of Mount Wake yesterday (April 23) evening. I am in Talkeetna and have just finished a debriefing at the Park. What follows is a detailed account in order to provide as much context as possible. See photos from our trip here. Please visit the Remember Lara Blog. On April 15, we flew to the Buckskin with reports that it was ``bristling with ice''. Unfortunately, this turned out not to be true and after a couple days of poking around, decided that spindrift over slab just wasn't our thing and decided to bump to the Gorge. It had snowed lightly every day and when Paul bumped us to the Gorge on April 20, we were happy to see that there was much less fresh snow there. The weather was quite good on April 21 and we skied over to the huge chimney system to the right of Snow Patrol on Dickey to see if it looked like a go. The first pitch turned us around, due to very steep, unprotectable snice, but it looked like it was filling in and might be in better shape with a couple more snow-free days. We tossed around a couple other objectives and decided that the NE Ridge of Wake looked like fun. We discussed leaving in the afternoon of April 22, so as to climb the snow at night, but decided to go in the morning. At 2:30 on April 23, we awoke and began brewing up for a single push attempt. We brought a JetBoil and shovel, but no bivy gear. We took a single set of cams, a few nuts and pins, six ice screws, and a single 8.5 x 60 Edelweiss Sharp since we figured we would be doing mostly ridge climbing so there wouldn't be too many rappels. We left our skis around 5:00 and started up the long snow gully. At the top of the gully, we roped up and simuled up the ice/névé corner for a couple rope lengths to a belay under a small overhang. Above was the technical crux---two steps of thin, awkward 90 degree névé with one steel nut between them. This 30 meters of hard climbing put us on more moderate terrain which we simuled. This brought us to a lot of shoulder deep wallowing. We climbed the ridge crest to a notch just before the fluted face high on the ridge. Here, we were turned around by a mushroom that we couldn't get off and snow conditions that were not favorable for going around. At this point, it was 15:30 and it looked like weather was approaching, so we weren't keen on waiting for the snow to set up. We began descending and downclimbed to the top of the steep step. I found a good nut and one 30 meter rappel just barely reached our belay under the overhang. We ate and drank at this alcove, then fixed one end of the rope to the anchor. The plan was that Lara would rap on the single strand, putting in a couple pieces at a traverse, and I would downclimb. She would either downclimb with me or do a similar rap/downclimb to the top of the first 30 meter step. This had a bulge of good ice at the top that we could V-thread to reach the top of the snow gully. I recall pointing out that the single strand of 8.5 mm was slippery in her Reverso. We did not put a knot in the end of the rope. She rapped to the traverse, then out of sight. A couple minutes went by, then I heard a scream, the sound of falling, then a thud. As reality sank in, I tried to calm my nerves. Since she had the whole rack, so I couldn't rap if I wanted. I packed up the rope and began downclimbing. It was 18:30. I came to a Yellow C4 before the traverse, then a Red C3 below it, then a 10 cm screw. Near what must have been the end of the rope, there was a marginal nut. 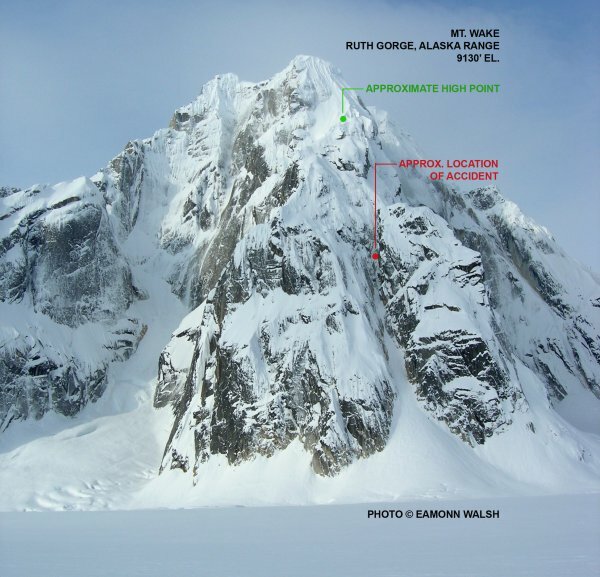 I downclimbed to the top of the step, then made one 30 meter rappel off the ice screw to reach the snow gully. There was an impact mark near a tongue of rock at the bottom of the step. I estimate that she fell 30 meters down 60-70 degree ice, then 35 meters of free-fall over the cliff, then about 300 meters of tumbling down the gully. As I downclimbed, I collected tools, screws, and other gear. Her body came to rest near the bottom of the snow cone. I reached it at 19:20. I skied back to camp and borrowed a sat phone to report the news. After a few minutes decompressing, I noticed the incoming weather and skied back with a sled. The owners of the phone helped me put her body in the sled and lower it down to the bottom of the snow cone. I pulled it back to camp in the midst of a squall which deposited a few inches of fresh, then erected the tent and settled in for a long night. As I try to piece together the accident, I suspect that she was concentrating on finding gear to belay from and didn't realize how close to the end of the rope she was. Fatigue may have been a contributing factor. I don't know if the slippery rappel system played a part. I do not think she was hit by a rock. I am confident that a knot in the end of the rope would have made the difference. This has certainly caused me to rethink the value judgement that the added security is not worth the hassle of stuck ropes and extra time to tie and untie knots. Throughout the day, we were in good spirits, constantly perpetuating one running joke or another. The climbing was enjoyable and the company was unbeatable. Our conversations were never dull. She was always up for a challenge and quite the rope-gun, although she would never admit it. I cherish the time we spent together.